Types of lies and their relatives. still insisting they’re not lying? People seem to have a lot of trouble agreeing on the difference between truth and lies. Some people go through life constantly accusing others of lying to them. Other people will mislead you any way they can while insisting, sometimes under oath, continuing to insist they would never tell a lie. 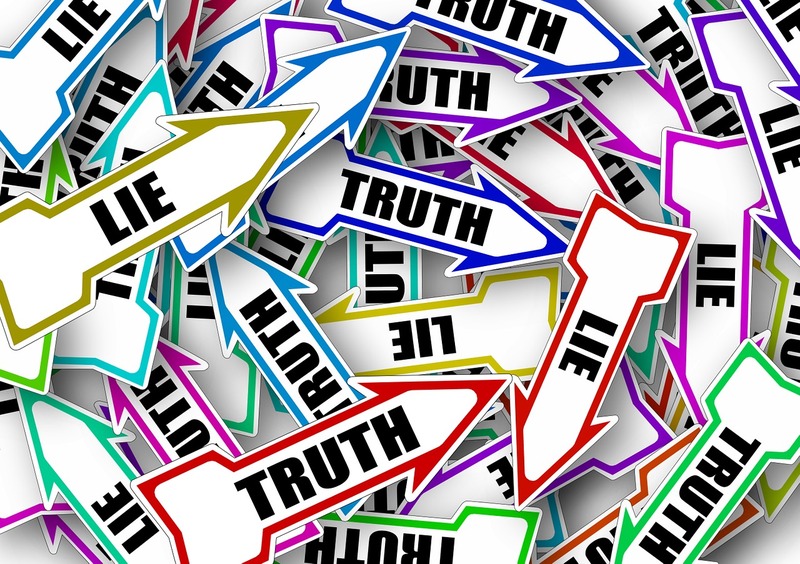 Here are some ways in which people may be deceiving you without having to tell detectable lies. Someone close to you starts describing their plans for the weekend, you two are going somewhere to see friends. What they leave out that one of your exes will be there. Maybe they forget to tell you that you will be expected to set up for the party. They have exactly lied to you, but by leaving out part of the story, your expectation of a relaxing weekend has turned into another day or two of strenuous work. Lying by leaving facts out, comes up in couples sometimes. One partner spends a lot of money, maybe sneaking new clothes into their closet, or hiding other expenditures. This deception goes on until credit card bill arrives. Some compulsive spenders will open new credit card accounts and hide the statement from the partner. Leaving out part of the truth can end up being more deceptive than an outright lie. Birthdays and the holiday season especially encourages white lies. These are things told to someone to mislead them with the intention of benefiting them. You tell your partner you are working late, but in fact, you have gone shopping for their birthday present. Evasion is often used to mislead. Maybe someone in your life has unpleasant news, you’re about to be laid off, or someone close to you as a health problem. They don’t lie to you, not directly, they just don’t answer your questions. By telling only half the story, leaving out the part you would not like, they have misled you. Salespeople can be good at this. You ask about a feature you want on the product; they immediately launch into a description of several other features. They’ve avoided you finding out their product doesn’t have one of the features you were looking for. Disagreeing about the truth can look like lying. Disagreeing about the truth often happened in the areas of religion and politics. One person says this is good for the country, while the other candidate tells everyone how awful this would be. Both are likely to accuse the other of lying to the voters. In close relationships, people often disagree about a great many things. When the argument gets heated, rather than acknowledge they have differing opinions, they are both likely to accuse each other of lying. Mistaken beliefs may seem like lies. Sometimes people are certain about something they say. “The company I work for will be doing a certain project. The store I shop at caries brand X.” You go there expecting a result, only to be disappointed. Did the other person lie to you? Not exactly. They told you something they thought was true, but you were misled. You may think that was a lie because you believe them and it turned out to be untrue. Are predictions the truth or lies? When someone predicts the future, be careful not to take that as a fact. Forecasters, whether it’s economic forecasts or weather forecasts, make lots of predictions. Some turn out to be accurate. Other predictions turn out to be wrong. If you invested money and lost a lot of it, or planned an outdoor event and it rained, you’re likely to be upset. Depending on who made the prediction, you may even believe they lied to you. Ambiguous, misleading statements, can conceal the truth. One way to slide something by others is to keep the statements very ambiguous. The fuzzier the statement, the more likely some people will hear what they want to hear. Some people talk a lot but include so few details that everyone hears a different version of the facts. This is your basic, garden-variety, lie. It’s not true, they know it’s not true, but they say it anyway. With these kinds of lies, the liar is hoping you will believe them, and they can get away with something, at least for a while. Boldface lies sometimes are believed. Boldface lies are so huge and outlandish very few people will believe it. Initially, these statements sound laughable. The boldface liars tell these big whoppers loudly and repeatedly. If you tell a big enough lie, often enough, some people may start believing it. This entry was posted in Trust and tagged boldface lies, books about recovery and PTSD, Bumps on the Road of Life, casino robbery, evasion, lies of omission, predictions, types of lies, white lies by David Joel Miller. Bookmark the permalink.